How Do You Use Sparklers? This probably seems like a silly question, as most people have been using sparklers since they were a toddler every time 4th of July or New Years rolls around. But you would be surprised how many people haven't used sparklers throughout their life. Unless someone shows you how to properly use sparklers you may be putting yourself in danger. We always hear about the countless accidents that take place when people use fireworks or sparklers without any type of experience. Our goal is to offer you a complete step by step guide on using sparklers for your event or party! 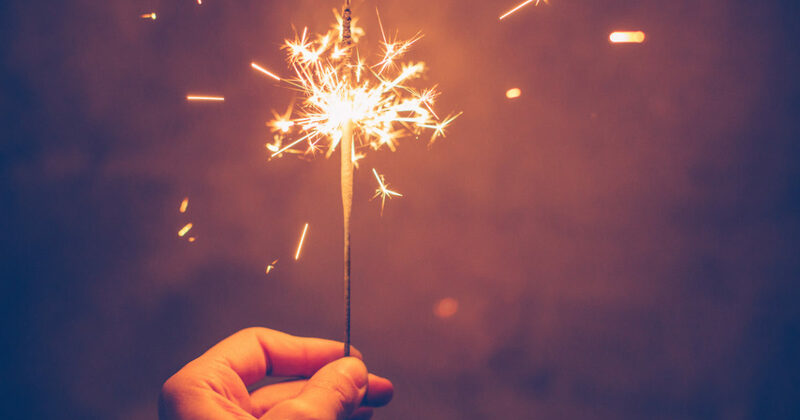 Throughout this article we will break down real experiences and instruction on how to effectively use sparklers to ensure you not only enjoy your sparkling experience, but everyone around you is safe! So how to use a sparkler? First thought would be to simply just go ahead and light and enjoy, but before you jump to all of the fun you need to make sure you cover all of your bases. There aren't that many rules when it comes to using sparklers, but each one is important and you should cross each one off of your list before you strike the match. First step on how to use sparklers is to find the right setting or location. Believe it or not, sparklers may be some of the hottest temperature products you can buy over the counter. Under no circumstances should you take using sparklers as a joke or use recklessly. You will want to make sure you are outside when planning to use any type of sparkler. Ensure that you are away from objects and people. You will want to locate an area outside thats open with no obstacles, vehicles and trees around you. If you do not purchase sparklers from a reliable company sparks may fly and you want to ensure people are not in danger. You do not want anything that is important to potentially catch on fire. Next, you will want to use the proper lighting source for your sparklers. Depending on the condition outside you may or may not make lighting your sparkler much more difficult. At Grand Wedding Exit, we recommend using a butane or barbecue lighter when it comes to lighting any sparkler. If you are lighting a single sparkler you may be able to easily ignite it with a lighter if the conditions are suitable. If it is too windy outside, it may be best to wait until the weather is more suitable to use these hot sparklers. If you are using these as wedding sparklers and need to light multiple sparklers you will want to acquire a barbecue lighter or punk sticks. Once you have picked a reliable and safe lighter, you will want to lit the tip of your sparkler. Ensure that your hand is on the lower end of the sparklers, which is often called the handle. Ensure your hand is far away from where the chemical composition ends and away from your clothing. After you have ignited the sparkler, it's time to safely enjoy the sparkler spectacle! 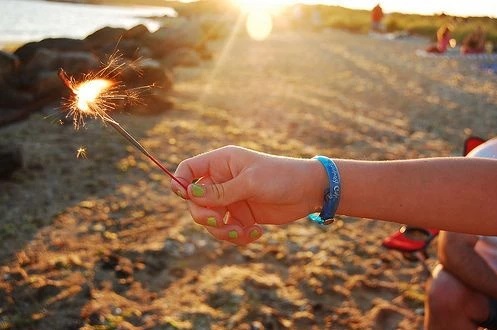 Ensure that you hold the sparkler outward away from your body and not aimed towards people. You may twirl your sparklers like a wand and create sparkling letters, but ensure that you are clear of all objects. Depending on the type of sparkler you have purchased will determine how long they last. We offer our premium sparklers which have a burn time of sixty seconds. Our 20 inch wedding sparklers have a burn time of over two minutes, while our most popular 36 inch wedding sparklers have a burn time of over three minutes to help capture some truly memorable sparkling moments! Once the sparklers last spark has gone out you will want to ensure you know how to properly and safely dispose them. Just because the sparkler is no longer lit, doesn't mean they instantly cool off. Sparklers may retain their heat for more than five minutes after they have gone out. There are some very important ways to safely dispose your sparkler. You will want to have a sparkler bucket filled with sand or water to easily place them in to cool off. If you quickly throw your sparklers in the trash they may burn through the trash bags or even worse potentially start a fire. Please plan on how to properly dispose your sparklers before you start all of the fun! Often the first time a person may participate in using a sparkler is at a celebratory event. You will want to make sure you listen to the event coordinator. If children are participating ensure that they have adult supervision. Often times you will see sparklers being used at weddings, birthday parties and holiday events. How To Use A Sparkler At Weddings? The most important aspect when deciding on using wedding sparklers is selecting the proper sparkler for your big day! It is important you find a company that offers true wedding sparklers and not your generic 4th of July sparkler, which can be very smokey and give off a very pungent smell. Using sparklers for your Grand Wedding Exit is an amazing alternative compared to using generic rice or confetti. We always hear back from brides mentioning the best pictures of their entire wedding night took place with sparklers. Typically, you will want to make sure the venue allows the use of sparklers and if you have a wedding coordinator they most likely have already done multiple wedding exits with wedding sparklers. How To Use Sparklers at Birthday Party? If you have come across sparklers at a birthday party, you most likely found them on top of the cake. You will want to make sure you purchase cake sparklers for this instance. That way your birthday cake will be free of sparkler residue and still be safe to use. If you use generic sparklers you will quickly regret that as you won't be able to eat any cake! Cake sparklers are virtually smokeless and ash-less and will ensure some fantastic photo's and experience to remember. Please take a look at our quick recap of our sparkler rules to ensure you have a fun and more importantly safe experience! After purchasing sparklers make sure you keep them in a dry and cool location away from direct sunlight.Light each sparklers one at a time. Do not light multiple sparklers at once.When sparkler is lit in hand, do not try to hold or carry any other object. solely focus on the sparkler.Avoid crowds of people or objects when a sparkler is lit.Have a plan on disposing the sparklers, whether water or sand bucket is ideal. Under no circumstance should you allow someone under the age of 4 to use sparklers, as they are not old enough to understand the danger. Sparklers should be used with ages of 5 and up only.Adult supervision at all times when kids are using sparklers.Have kids wear gloves or "plastic cup gloves" to shield any potential flying sparks.Make sure children are fully dressed and skin is not exposed. Show them how to use a sparkler multiple times before letting them hold them on their own.Do not allow kids to run around with sparklers at any time. You never know when they could trip or accidentally fall over. We hope you are now experienced on "how to use sparklers" safely and enjoyed our guide. Sparklers are an easy item that can help make your event or night one to remember for all ages. You will want to make sure you buy sparklers from a safe outlet to ensure a safe and fun night. Remember sparklers are fun for all events, weddings, birthday parties, 4th of July and New Years. If you have anymore questions or concerns when using a sparkler do not hesitate to reach out to us! We have a full time staff at Grand Wedding Exit that can help plan the perfect end to your night!